Do you have three arms, live alone, and love to cook? Oh that Nancy Creech! 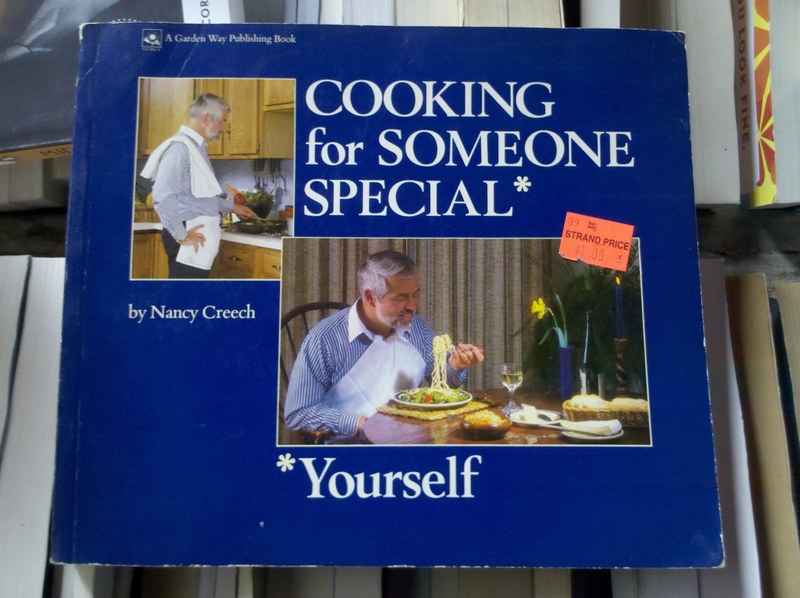 She had me thinking I was going to be looking at recipes for that special someone in my life (i.e. my lover) but instead she meant ME! What a gal. **I Mean Just Look at the Way You Eat Pasta. Slow Down Rachel Ray! Here is an entry from the diary I kept when I was eleven, with footnotes of my commentary today. I got this idea from Paul Feig, who created Freaks and Geeks and writes hilarious books that everyone should read. Anyway, my diary! Some background: I’m a dumb 6th grader. I’ve made up with my mom. But I’m still a little mad. And frustrated. I am also not happy with Abbey! She is MEAN! Didn’t really spend enough time working on the parallelism of that sentence. I hate it when drama affects my grammar! I don’t remember which friend named Beth I was talking about, much less why my mom was “mad” that I wanted to get together with her. I suspect that my mom was mad that I refused to clean my room and that was why I couldn’t go out, but that didn’t sound dramatic enough for a diary. Hence the change to make it sound like my mom had some sort of personal problem with Beth, i.e. there was actual drama in my life that didn’t revolve around cleaning my room. EVEN. IF. my diary was a living thing listening to me, what am I telling it to wait for? Like we’re solving a crime or something? Guess if I made good on THAT promise.